Hand-cut or stamp-cut paper, collaged onto Japanese kites using an acrylic binder. The smallest pictured are 1 1/2 inches in diameter. These are then chained together with string and suspended together, in layers, on a structure that is mounted on a wall. An example follows. 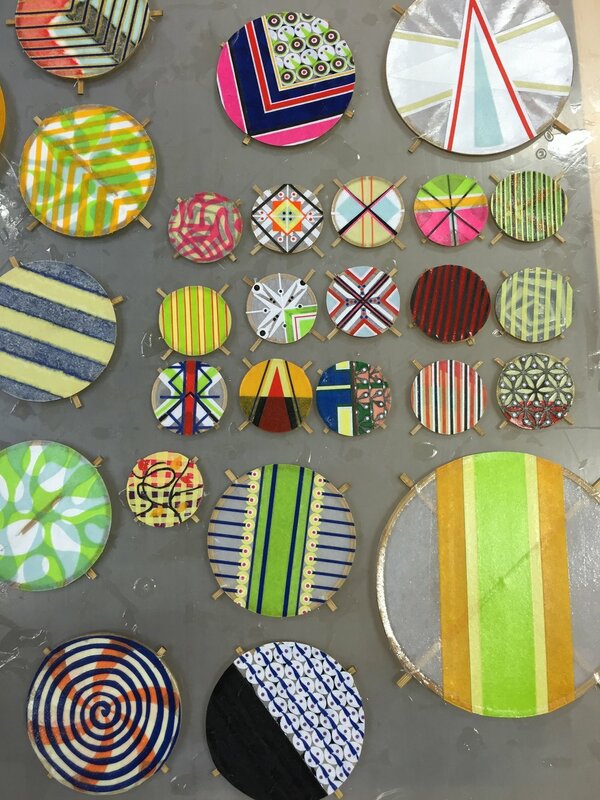 These designs are created for hanging sculptures. The designs are created in Adobe Illustrator, printed and then embedded in resin within a bamboo kite frame. Hundreds or thousands of these resin kites are then suspended together to form a hanging sculpture - An example of a completed sculpture follows. Hanging sculpture using resin kite components.